This tiny star has 7 planets that potentially could be suitable for life. The first step in finding life outside our own planet is to find a planet like our own: small, rocky, and at just the right distance from the star that liquid water could exist on its surface. That’s why an announcement today from NASA is so exciting: The space agency, along with partners around the world, has found seven potentially Earth-like planets orbiting a star 40 light-years away. Three of the planets are directly in the star’s habitable zone, meaning water can mostly likely exist on the surface of them. One of them, Gillon said, has a mass “strongly to suggest a water-rich composition.” And it’s possible that the other four could have liquid water, too, depending on the composition of their atmospheres, the astronomers said. The exoplanets orbit a star in the constellation Aquarius called Trappist-1. And it’s a solar system very different from our own. For one, Trappist-1 is a tiny, “ultra-cool” dwarf star. It’s cool because it’s small: just about a tenth of the mass of our sun and about one-thousandth as bright. But its low mass allows its planets to orbit it very closely and remain in the habitable zone. The distance at which the planets orbit Trappist-1 is comparable to the distance of Jupiter to its moons. All the planets are believed to be rocky, and are all believed to be around the size of Earth, give or take 10 to 20 percent. The star’s dimness is actually what led to the discoveries of these planets. When astronomers search for exoplanets, they typically look for a temporary dimming of a star — an indication that a planet has passed in front of it. This method makes it hard to find small, rocky worlds orbiting big, bright stars. If the planets are too small, they’ll get washed out. “Maybe the most exciting thing here is that these seven planets are very well suited for detailed atmospheric study,” Gillon said. The James Webb Space Telescope, set to launch in 2018, will have the ability to measure the chemical composition of exoplanet atmospheres. If the atmospheres contain telltale gases like ozone, oxygen, or methane, life could exist there. “We can expect that in a few years, we will know a lot more about these [seven] planets,” Amaury Triaud, another of the paper’s co-authors, said. If this all sounds a bit familiar, it’s because astronomers announced three potentially habitable planets around Trappist-1 in May. Today’s reveal adds four more to the mix. Right now, the astronomers are beginning to study the planets’ atmospheres with the telescopes they have. And from these observations, they feel fairly confident that the worlds are rocky. “For detailed characterization, we will need James Webb,” Triaud said. In the meantime, we just have our imaginations to fill in the gap. This is an artist’s rendition of what the fifth planet in this bizarre solar system might look like. 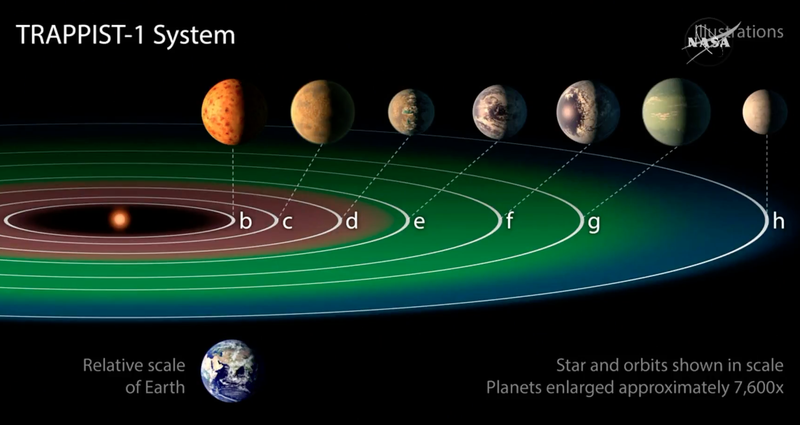 These planets are believed to be tidally locked to the star, each has a permanent day side and a permanent nice side. And because the planets are so close together, they’d appear in the sky like moons. The more Earth-like exoplanets astronomers find in the galaxy, the more they update their estimates of how many Earth-like planets could be out there. “For every transiting planet found, there should be a multitude of similar planets (20–100 times more) that, seen from Earth, never pass in front of their host star,” Nature reporter Ignas Snellen explains in a feature article. And the more exoplanets there are, the more likely it is that life exists on at least one of them. “With this discovery we’ve made a giant, accelerated leap forward in our search for habitable worlds and life on other worlds potentially,” Sara Seager, a leading exoplanet expert at MIT, said during the announcement. This one star system, she said, gives astronomers many chances to look for life, and refine their understanding of exoplanets in small-star systems. Also promising: Tiny, cool stars like Trappist-1 are some of the most common in the galaxy. Investigating them will likely yield more exoplanet discoveries. Which will help get us closer to finding places like Earth.